Information about the best National Forest Camping in the West can be found right here on our awesome blog! This area is home to some of the most beautiful forests on earth. They offer great options for camping and any outdoor activity your heart desires. Plus with three Lost Campers campervan rental depots located in Salt Lake city, San Francisco and Los Angeles, these amazing and often free best National Forest Camping in the West, are quick and easy to get to. Here are fun facts about Utah: Every county in the state has National Forrest in it. “Utes” means “Mountain People”, we don’t mess around when it comes to outdoor fun in Utah! 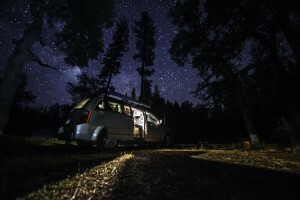 Once you have collected your awesome camper van in SLC, drive South for some of the best National Forest camping around! Fish Lake National Forest is a beautiful area in central Utah where the mountains meet the desert. 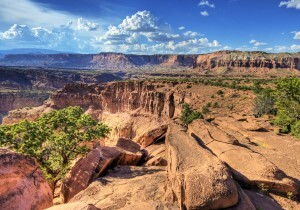 It is close to National Parks such as Capitol Reef and the Grand Staircase National Monument which can definitely fill out a great road trip itinerary. National Forest campgrounds are a great alternative to the busier National Park campsites. Single Tree Campground is one of the largest campgrounds in Fish Lake. It offers spacious sites and views of an open vista of Capitol Reef. 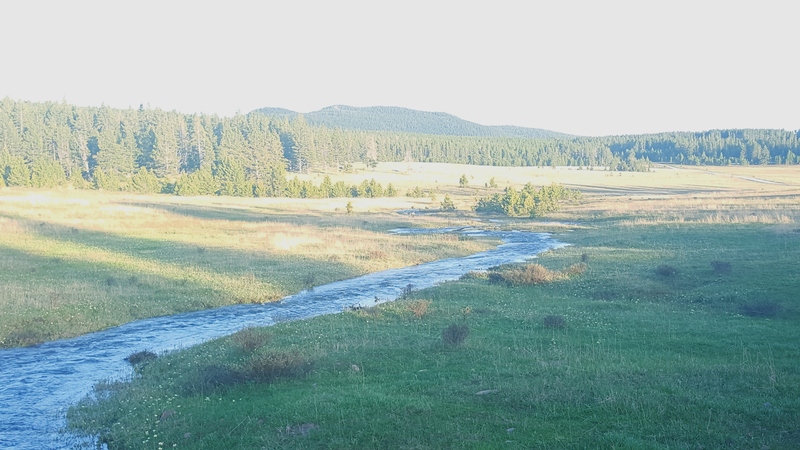 Pick up your van in Salt Lake City and head Northeast to the Ashley National Forest on the Utah-Wyoming border where you will find beautiful places such as Flaming Gorge National Rec. Area! There are 43 campgrounds in Flaming Gorge alone, not to mention various others throughout Ashley, so you won’t have to worry about struggling to find a spot. We recommend rafting the Green River while you are in the area- it is a blast! Here is an interesting fact about California: Wilderness areas cover 15% of the state! Pick up a van from San Francisco and head for the Sierras. Inyo National Forest is home to Mount Whitney, the highest Peak in the contiguous United States. Here you will also find gorgeous mountain lakes and enough outdoor fun to wear out even the most energetic outdoor junkie. Be prepared for some amazing high elevation camping. The campgrounds around Mt. Whitney average 10,000 feet and above, so pack layers even in summer. Don’t miss out on a visit to the beautiful Mammoth Lakes! This area is easily added to an itinerary that includes Yosemite and Sequoia National Parks. Pick up your camper van in LA and head North toward Santa Barbara for the best National Forest camping along the Pacific Ocean. Los Padres National Forest offers the best of both worlds: gorgeous mountains and coastal beauty! There are over 12,000 miles of maintained trails for day hikes or backpacking getaways. You can find everything from dense forest and streams to ocean beaches. There are loads of great campgrounds throughout Los Padres to enjoy. This is a great area to explore while traveling the Pacific Coast Highway. Ready to plan your top Western National Forest camping holiday ever? Between May – September, our budget campervan rentals are often booked up 2 – 3 months in advance. So Book your camper van now and let the fun begin! 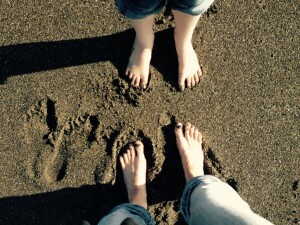 Spring Utah Camping is just around the corner! If you couldn’t get away for a small vacation over winter, or just prefer the more mild temperatures, we’ve got you covered. Here are 4 Great Spring Utah Camping spots for you to check out on your next adventure. Spring Camping in Utah is the perfect time to get out and see what Utah’s great outdoors have to offer before the parks start filling up. Start off at our Salt Lake City depot, we’re perfectly located to get you close to any park you’d want to visit without having to spend forever driving. Our first camping spot is Mirror Lake. Located only an hour and a half outside of the city, this camping spot is popular all year round – and for good reason! Mirror Lake offers an assortment of things to do for campers of all ages. Fish, boat, and hike around the lake’s gorgeous waters. 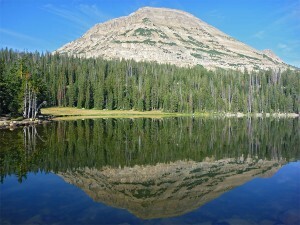 Mirror Lake is inside of the Uinta-Wasatch-Cache National Forest, so be sure to take a gander at what else there is to do while you’re there! #2: Capitol Reef National Park, Full of Spring Blossoms! Spring Utah Camping can still be a little on the nippy side, so our next destination is down south. Capitol Reef National Park is an often forgotten stop in Utah’s Big 5- but spring is definitely the season you don’t want to skip it! Pioneers once stayed in Capitol Reef, and some of the orchards they planted in the 1800s are still there today. In spring, they bloom into life. It’s a sight you’ll definitely want to see. While you’re in the area, check out Goblin Valley! The difference in scenery is astounding, but you’ll be glad you took the time to check it out. #3: Sand Hollow State Park, Relax by the Shore! Utah’s newest State Park is also a wonderful destination for some Spring getaways. Sand Hollow State Park is quickly becoming one of Utah’s most visited State Parks, and for good reason! The reservoir set against the red sand dune environment is striking- and sure to be memorable to all visitors. Campers can enjoy an array of activities from hiking to boating, you’re sure to have a fun time at Sand Hollow! One of our Lost Campers campervans can get you there in no time. 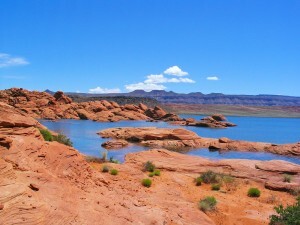 Sand Hollow is a 30 minute drive from the city of St. George. 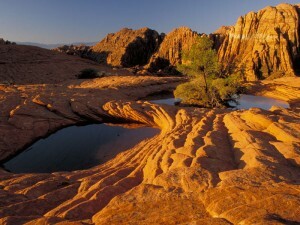 Last, but not least on our list for great Spring Utah Camping is Snow Canyon State Park. It’s only a 4 and a half hour drive away from our Salt Lake depot! Located in Southern Utah, Snow Canyon is home to a collection of unique geology and wildlife. Several endangered or threatened species live within the park- many of them cannot be found anywhere else in the state! With almost 40 miles of hiking trails at your disposal, you’ll definitely have plenty of exploring to do. If you feel like you need a little more adventure, be sure to stop in to Coral Pink Sand Dunes State Park, it’s only about a 2 hour drive! Our rates are at our lowest until March, 2017! Get your reservation squared away soon, we’re booking up fast!